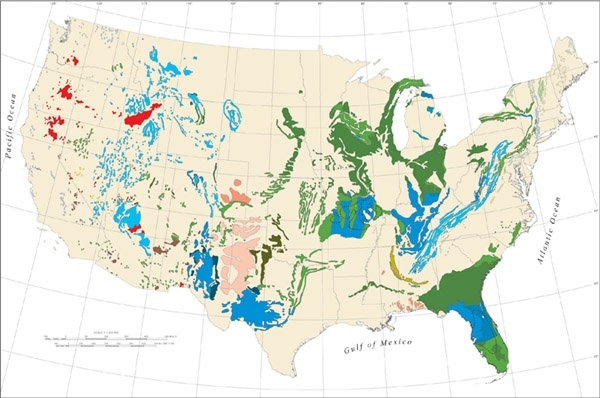 Above: Thumbnail image of karst areas in the contiguous 48 states (Data and graphics files below include Alaska and Hawaii). These data are digital facsimiles of the original 1984 Engineering Aspects of Karst map by Davies and others. This data set was converted from a printed map to a digital GIS coverage to provide users with a citable national scale karst data set to use for graphic and demonstration purposes until new, improved data are developed. These data may be used freely with proper citation. Because it has been converted to GIS format, these data can be easily projected, displayed and queried for multiple uses in GIS. The karst polygons of the original map were scanned from the stable base negatives of the original, vectorized, edited and then attributed with unit descriptions. All of these processes potentially introduce small errors and distortions to the geography. The original map was produced at a scale of 1:7,500,000; this coverage is not as accurate, and should be used for broad-scale purposes only. It is not intended for any site-specific studies.